If you suffer from sciatica pain, my simple sciatica stretches and exercises will give you relief. If you have a self-healing personality, this is the information for you! Sciatica home treatment is very possible and can be very effective. Lower back pain from sciatica can be very debilitating, but it can be treated, if you listen to your Body Window. The sciatic nerve is the largest, longest nerve in the human body. It comes out of the spinal cord in roots at various levels of the lower back area. The nerve roots then travel through openings in the vertebrae and merge into the large sciatic nerve. The sciatic nerve then runs through the hip and down the entire length of the leg branching on its way down to innervate the different parts of the leg. If you suffer from pain that starts in your hip or lower back and radiates down your leg, sometimes all the way to your foot, you may have sciatica. Some feel sciatica pain in one side only while others feel it on both sides. Sciatica symptoms also include feeling numbness or tingling in the buttocks, leg, and feet and or feeling burning or stinging sensations. Sometimes the sciatica symptom presents as a deep, dull ache. Sciatica pain is not a diagnosis in and of itself, but rather the symptom of various conditions. Because the sciatic nerve originates in the lumbar area of the spinal cord, anything that puts pressure on the roots of sciatic nerve can cause the sciatic pain. The pain can be due to any degenerative changes in the vertebrae or discs of the spine, such as a herniated disc, spinal stenosis, or osteoarthritis of the spinal vertebrae. However, the most common cause of sciatica is from pressure from a muscle deep inside your hip called the piriformis muscle. When the piriformis is overused from chronic tension and physical activity, prolonged sitting or prolonged standing, the muscle becomes larger than its normal size. The muscle then presses on the nerve that runs beside it, around it or sometimes through it. 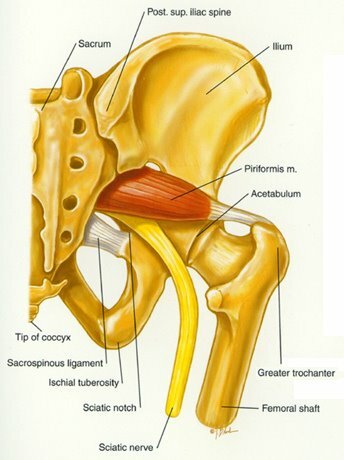 In the diagram to the left, the sciatic nerve is in yellow, and the piriformis muscle is red. The diagram shows various anatomical possibilities between these two structures. Sciatica pain from pressure from the piriformis muscle is called "piriformis syndrome." If this is you, the sciatica stretches I can teach you will be of most use to heal your pain. Often sciatica is associated with lower back pain, since other conditions that cause lower back pain can lead to sciatica symptoms. The sciatica stretches in this article will treat all types of lower back pain as well! I am lucky enough to have never had sciatica. However I have observed the debilitating effects that it causes. As a part-time in-home nurse, I took care of a totally disabled woman for many months. Her care was extremely complex since she was ventilator-dependant and totally immobile. Her husband was a constant presence, by her side, dictating her care to the nurses at every turn. I believe that I am a relatively surrendering person, at least I work on it a lot! However, after many months I quickly grew weary of the husband’s vigilance. Despite daily nursing care for his wife throughout the day, he refused to leave her side for long. His fear that something would go wrong if he were not present was palpable. It took almost a full year and a half for him to trust her care to me and go out and run errands. He slept by her bed at night, awake and alert at her slightest noise, to suction her or reposition her, or do whatever she required. As a result of his fear, tension and overuse of his back, he developed killer lower back pain. Despite my pleading that he rest and do sciatica stretches and foam rolling for his lower back, he would only get to it once in awhile. I finally talked him into buying a foam roller, but he rarely used it. He preferred to go for a bike ride if he felt he could, for about 30 minutes a day. As a result of his lack of care for his back, the pain progressed to sciatica pain. He went to the doctor who told him he had spinal stenosis and prescribed physical therapy. He went briefly to the therapist and then stopped because it was too far and he didn’t have full insurance coverage. He kept pushing through the pain, to be at his wife’s beck and call, despite a new limp that he developed and a back that was so immobile he visibly looked in agony. Despite his excuses, I knew the reason he did not take care himself was due to fear of the future, guilt and lack of trust in the support systems that he had around him. His own son and daughter were never present. I am not sure why, but I suppose that all he needed to do was ask. They seemed like caring, giving children to me. Recently, I went back to their home and his condition still had not changed, despite my giving him many exercises for his sciatica, specific piriformis and sciatica stretches for him to do. As discussed above, there is a reason for your sciatica pain. The origins are spiritual, emotional AND physical. The metaphysics of lower back pain and sciatica are mostly the same, however with slight differences perhaps. According to Louise Hay, sciatica symptoms are a result of being hypocritical. Interesting, isn’t it? In the case of my client’s husband, I always felt an underlying current of control by the wife. The reason that her husband stayed by her side constantly may have been more about his guilt and the consequences if he was not there and something happened. Yet he longed for freedom. The few instances that I was able to shoo him out the door, he looked relieved and refreshed when he returned. If you have sciatica pain, you may meditate on your own hypocritical tendencies. Is your sciatica there to alert you that you are not being true to yourself or something in your life?? Because sciatica symptoms manifest themselves in the leg, the foundation of what we stand on, the issues of fear of the future, feeling lack of support, monetarily, emotionally and familial may all be involved. These are all 1st chakra energy issues, so I strongly recommend you click on this link and learn about this as well. Trusting in a source outside of us is definitely difficult in our fiercely independent and hard-working culture. We all say we trust in God to provide for us, but mostly this is lip service. When we come right down to it, we believe that we have to do it all on our own. What we say and what we do are often out of sync. I am guilty for sure. My client’s husband was certainly a manifestation of this, as neither he nor his wife trusted in their care providers to supply their needs. Maintaining independence and control was their only concern. If you have sciatica pain, you may wish to meditate on your own metaphysical cause. Do you always have to be in control? Do you feel like you don’t have enough money? Do you feel like you receive no support from friends or family?? A simple sciatica home treatment plan would involve sciatica stretches that open the hip. Since the piriformis muscle may be involved, simply stretching and opening the hip will also stretch the piriformis. If you do any and all postures of yoga, I guarantee that you will improve your sciatica. The single most important yoga pose for sciatica is the Eye of the Needle Pose. This is a wonderful pose, that I devote an entire article on! Please click on the link to see this article. 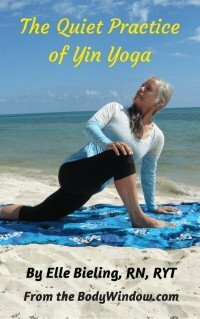 I have an entire series of Yin Yoga poses, that will help you open your hips to heal sciatica. Here is a photo of the pose. Another great sciatica stretch is the simple Bound Angle Pose. You can do it sitting or reclining, whatever feels the best to you. Yet another great sciatica stretch is the Yoga Garland Pose with hands in the prayer position. This is also known as the Squat Pose in Yin Yoga. This pose is often difficult for men, so be ginger when you try it. Simply squat down and with your elbows inside your knees providing a gently pressure outward, place your hands in the prayer position. Make sure you do both legs when you do this piriformis stretch. The best sciatica home treatment plan utilizes lower back pain exercises. Opening the hips through foam roller exercises and yoga poses is the only way to heal sciatica pain. A complete program that encompasses all these aspects will speed you on your journey to healing. I definitely recommend the Body Window's comprehensive program of lower back pain exercises. God/the Universe supports me in all things. I trust that ALL my needs will be met. I surrender to all that is good. I surrender to the infinite possibilities that I cannot always see. "His eye is on the sparrow, and I know he watches me." May your path to healing your pain be complete when you learn to understand the metaphysical cause for your sciatica. May these sciatica stretches and videos be your instruments for complete body-mind-soul health and healing!